In short, iron oxide and its unfriendly cousin magnetite are extremely bad for hydronic systems. We can do a lot to combat both the development of iron oxide and its inevitable impact on our HVAC systems by including a few select pieces of equipment at initial system design or for retrofits when we're looking to improve system efficiency or solve system problems. Air-dirt separators: Let's face it, everyone in the commercial building industry wants to save money without sacrificing heat transfer and efficiency. The Taco 4900 Series Air/Dirt Separator can help design engineers and building owners prolong the life of system pumps, piping and components by removing air and dirt from the system. The 4900 uses patented PALL rings to remove microbubbles, sand, dirt and rust. Dirt and iron oxide particles are caught and sifted to the bottom of the tank, where they can be removed by a blowdown valve. One example of the effectiveness of the equipment is found at the Renaissance Providence Hotel. The hotel had air in the piping system which caused iron oxide to develop and the air conditioning system to be impacted. Guest rooms were stuck at 75ºF dry bulb and 64º wet bulb resulting in unhappy guests and a huge problem for the hotel. After testing the water in the system, engineers thought that at least some of the sludge in the system could be micro-biological induced corrosion (MIC). The MIC was certainly contributing to piping corrosion. Taco solved the problem with an air-dirt separator. Click here to read Taco's case study on the hotel. Magnetic dirt filter: The bigger the system, the bigger the problems can be when it comes to iron oxide and magnetite. Using high-grade neodymium magnets, the ADEY magnetic filter is a simple device designed to solve a complex problem. Built to ASME standards, the filters have a stainless steel cast body, individually removable magnetic rods, EPDM full-face flange gaskets for maximum strength seal at high temperatures and flexible installation options. 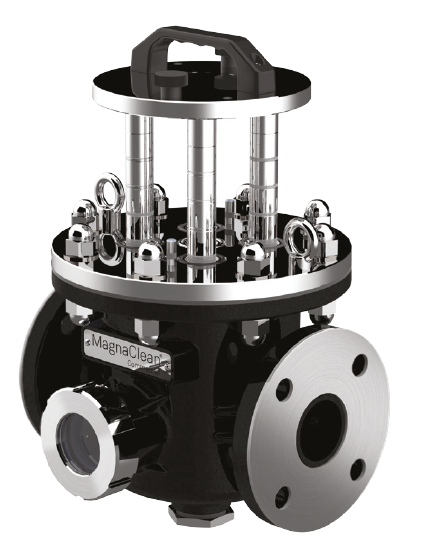 LPD Y-Strainers with magnets: Metraflex designed the lowest pressure drop Y-strainer on the market and then upgraded it with a neodymium magnet to catch iron oxides. The rare-earth magnet is installed into the collection vortex of the LPD which maximizes the magnet's ability to catch iron oxide. 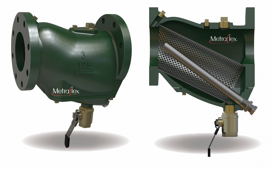 The blowdown port allows a thorough blowdown of the strainer to remove iron oxide while in service. If you are a design engineer and want to learn more about how to combat iron oxide in your HVAC systems, Heat Transfer Sales offers a PDH seminar for engineers called "Air and Dirt DO Hurt." Our training engineers come to your office in NC or SC to teach you more about how to fight air and dirt in HVAC system design to increase the longevity of the system, improve efficiency and, perhaps most important to building owners, reduce downtime.